The city needed a robust yet compact UPS to safeguard its disaster recovery site. With a population of nearly three million people, Chicago holds the title of being the third largest city in the United States. Considering all that makes Chicago superior, it’s no surprise that when the time came to invest in a disaster recovery (DR) solution four years ago, city officials wanted nothing but the best. That included a power protection solution capable of delivering the highest level of availability for the city’s exchange email server and eight critical applications supported at the DR site. To ensure that level of reliability, the city quickly turned to Eaton as the manufacturer of choice to provide the site’s uninterruptible power system (UPS). The double-conversion Eaton 9390 UPS proved to be the perfect solution to help the city of Chicago complete its disaster recovery efforts. Having purchased a 100 kVA unit, the city has more than enough capacity to protect its critical applications against potentially devastating power anomalies. 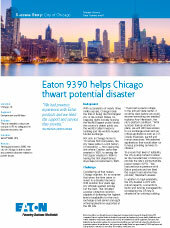 The city receives additional peace of mind knowing the 9390 is protected by an Eaton service plan. With the addition of the Eaton 9390 to its disaster recovery efforts, the city of Chicago has continued its commitment to excellence.